When writing my novella contribution for Silver Belles and Stetsons, I looked into when Stetsons were first branded as a hat company, and what it meant. After all, silver bells, "belles", and Stetsons had better make a showing in an anthology named such. "Stetson" seems synonymous with "cowboy hat" and both seem critical to the modern image of an Old West, Victorian-Era Cowboy. 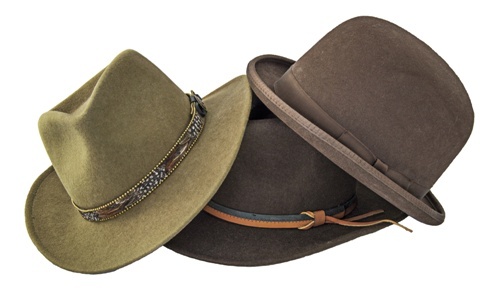 Stetson is a brand of hat manufactured by the John B. Stetson Company. Founded in 1865, they're known for many different shapes of hats, named differently. Campaign hat (Smokey Bear). Calvary hat. Prospector's hat. Ten-gallon hat. Boss of the Plains hat. Technically, every 'kind' could be accurately called a Stetson. BUT THE BOWER WON THE WEST...? Bowler hats were the most popular in the American west. Originally created in 1849 in Great Britain for a nobleman, it became popular with the working class and as with many things, then became popular and common in the States. During the years of westward expansion, men went west with what they owned or could afford to purchase... and their bowlers went with them. 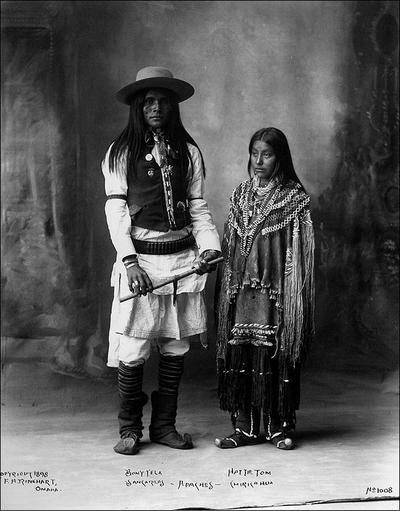 Interestingly enough, bowlers were often preferred to wide-brimmed hats in the West because they wouldn't blow off in the wind, while riding a horse, or when sticking one's head out of the window a speeding train. In the United States, the bowler became known as the derby, and lent its name to outlaw Marion Hedgepeth was commonly referred to as "the Derby Kid". Derbies were worn by lawmen and outlaws alike. 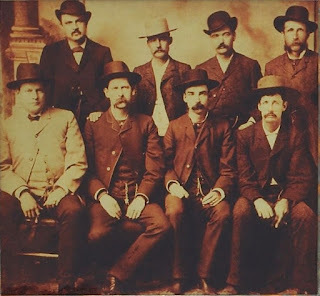 In the image, above, of Dodge City Peace Commission (1883), many of the men are wearing a Boss of the Plains hat. The wide, flat brim and rounded crown are key characteristics. Top row, far left and top row, second from the right are the popular bowler hat (a.k.a. Derby). This rounded-cap, smaller brimmed hat is also frequent in Victorian era pictures of the Old West. In the 21st Century, hats are a fashion statement and little else. Very casual hats (think baseball caps) might be a quick fix for a bad hair day. Men in the 19th century wore hats for entirely different reasons. Note that vintage photographs on the street show every man and boy with covered heads. This was partly for protection from the weather, sun (sunburn and dehydration), falling debris in a mine or crowded city streets with many-floored buildings rising above the sidewalks. Hats kept body heat in and the hair clean. 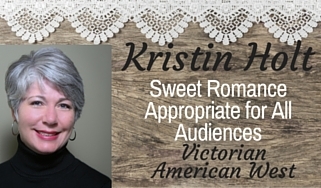 They also showed authority, social status, and became part of the expectation of "properly" dressed. Settlers, ranchers, cowboys and miners wore hats in the open of the Old West for various understandable reasons. 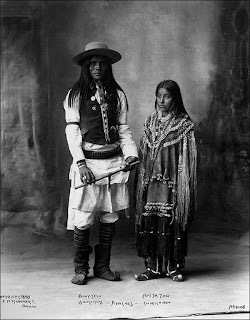 Without clothing like modern rain slickers, men depended upon their wide-brimmed hats for protection against torrential rain and snowfall, the blazing sun of the Great Basin and Sonoran Deserts, and extreme temperatures. Air space between the crown of the hat and a man's head acted as prized insulation against the weather, hot or cold. So yes, Stetsons were ubiquitous. Men settling the West wore hats, pretty much all the time unless in church or at their mama's kitchen table. 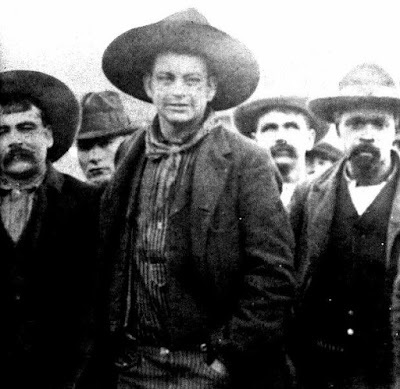 I'm glad the western cowboy hat has survived as an icon of the past. I'd love to hear your thoughts. 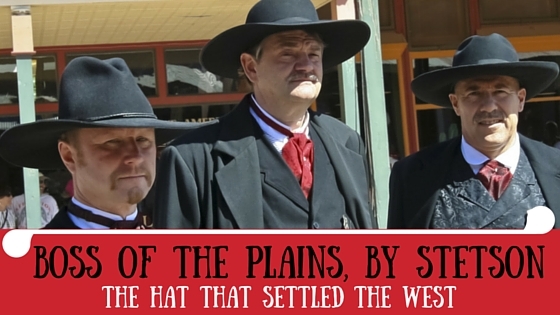 What do you think about hats from the Old West era? What have you noticed as you browse old images, read about the past, or delve into history? I love hats and wish they would come back in style a bit more. They are a nuisance when the wind blows and if they are particularly wide-brimmed (I can't see that working on a crowded subway!) but there is just something elegant and fun about them. Thank you, Kathryn, for your thoughtful and interesting reply. It's a pleasure associating with you! Kristen, Didn't know that much about the history of the two hats. Thanks. Doris McCraw/Angela Raines-author. Furnaces and Hot Water Heaters . . .
My Mail Order Bride Story and....Why Iowa???? Deck the Halls with....Poison Oak?